If you are very lucky when you're in Hawaii, you may see a Hawaiian monk seal. The Hawaiian monk seal is an endangered species, with a current population estimated to be only about 1,200. It was officially designated as an endangered species on November 23, 1976, and is now protected by the Endangered Species Act and the Marine Mammal Protection Act. Needless to say, it is illegal to kill, capture, or harass a Hawaiian monk seal. This is why when a monk seal is found on a beach in Hawaii, lifeguards or other officials secure the area with police tape. The ancient Hawaiians called the monk seal 'Ilio holo I ka uaua (dog that runs in rough water) which, when you think of it, made a lot of sense since they had never seen a seal before. "An adult monk seal is usually dark gray or brown with a light gray or yellow belly. Adults can weigh anywhere from 375 to 500 pounds; adult females are generally larger than males. Pups are jet black and usually weigh 25 to 30 pounds at birth and weigh up to 132 to 198 pounds within five to six weeks. The monk seal's common name is derived from its folds of skin that look like a monk's hood, and because it spends most of its time alone or in very small groups. They spend most of their time in the ocean but like to rest on sandy beaches, and sometimes use beach vegetation as shelter from wind and rain. Monk seals are expert swimmers and divers; one seal was recorded diving into depths in the range of 66 and 96 fathoms (396 to 576 feet). The average monk seal dives 51.2 times per day. The life span of the Hawaiian monk seal is from 25-30 years." For many years, the most likely places that you might see a Hawaiian monk seal was on the island of Kauai. It is the island closest to their principal feeding grounds in the Northwestern Hawaiian Islands (Nihoa Island to Kure Atoll in the Papahānaumokuākea Marine National Monument). They are frequently seen resting on Poipu Beach and on the small beaches along the Na Pali Coast. In recent years, however, Hawaiian monk seals have been seen on all of the main Hawaiian islands. In May 2009, a Hawaiian monk seal who was given the name of Kermit spent most of a full week basking on the sand at Queen's Beach right in Waikiki. His proximity to popular hotels and surf spots made his haul-out site a popular stop for beach-goers. So, what should you, as a visitor know when you find a Hawaiian monk seal on the beach? The folks at the Waikiki Improvement Association provided some excellent answers to some of the most frequently asked questions about Hawaiian monk seals. Are They Dead on the Beach? Probably not. Monk seals frequently "haul out" on beaches or rocky shorelines to take a break from eating and swimming, or sometimes to nurse their pups. What Do Monk Seals Eat? Scientists have found monk seals to eat a variety of things including small fish, lobsters, and other crustaceans. Monk seal eat a LOT—an adult male seal can be up to 400 lbs! Should I Try to Approach or Touch a Monk Seal? Try not to disturb the seal; monk seals are known to not be a fan of close contact. It is also illegal to kill, capture, or harass the seal in any way under the Endangered Species Act and the Marine Mammal Protection Act. That means things like touching, riding, feeding, tickling, or anything else that would disrupt the seal's natural behavior. What Are the Main Threats to Monk Seals? 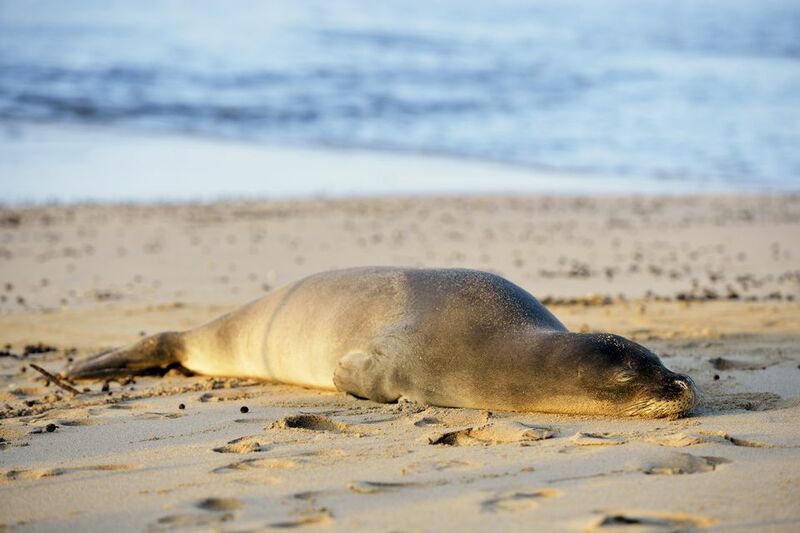 The main threats to the Hawaiian monk seal include low survival of juveniles due to starvation, entanglements in marine debris, predation of juveniles by sharks, disease outbreaks, and human interactions in the Main Hawaiian Islands. "Human disturbance" is defined in the recovery plan as recreational fishing gear entanglements and mother-pup disturbance. Share what you learn about these animals and how to protect them. Volunteer with NOAA's Monk Seal Response Program.